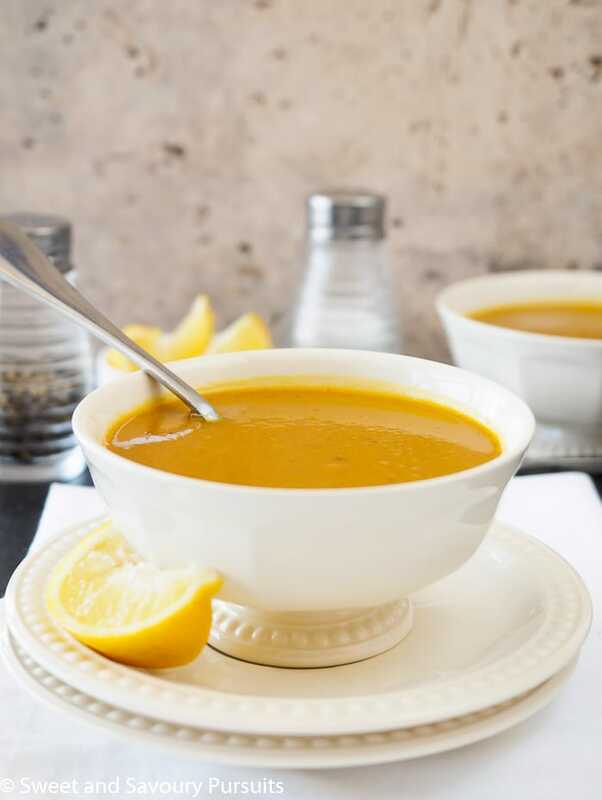 Make this easy and creamy Sweet Potato and Red Lentil Soup for a quick flavourful meal that is comforting, healthy and delicious! I didn’t think I would be posting a recipe for soup this week, after all it’s the end of April and hot soup isn’t usually on my mind at this time of year. Though we’ve had beautiful sunny days, there’s still a chill in the air. So in my home, soup is still on the menu. As someone who is always pressed for time, I really enjoy how quickly one can make a healthy pot of soup. This Sweet Potato and Red Lentil Soup can be ready in just about 30 minutes. And you don’t need an instant pot to do so. By using split red lentils instead of brown or green, you can reduce the amount of cooking time significantly. To make this soup extra flavourful, you’ll need to use aromatic ingredients and spices such as garlic, onions, ginger and curry, all of which complement sweet potatoes and lentils. Once you’ve gathered and prepped your ingredients, you’ll want to start making the soup by cooking the aromatics so you can build the flavour base of your soup. Then you’ll add the broth, lentils and sweet potatoes. Let the soup simmer until the ingredients are tender, adjust the seasonings to your liking and the soup is ready. This soup can also be made in a slow cooker. For the best flavour, cook the aromatics on the stove top before adding them to you slow cooker along with the rest of the ingredients. Cook on low for about 8 hours or on high for 5 hours or until the lentils are cooked. Serve this Sweet Potato and Red Lentil Soup with some hearty bread for a delicious and comforting meal. Enjoy it chunky or purée it in a blender for a creamy texture. If you like red lentil soups you might want to take a look at this other delicious soup I have on the blog. Enjoy! Depending on the level of heat you like, you can choose a mild or spicy curry. 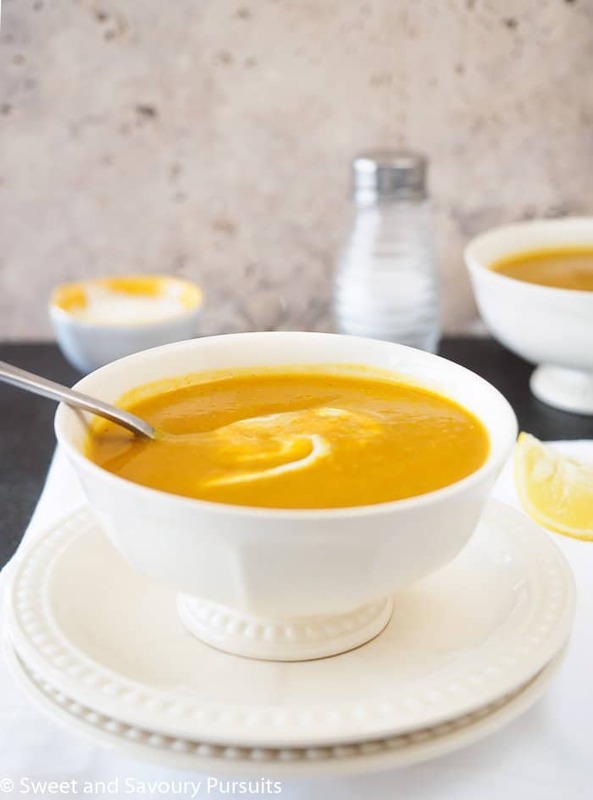 Make this sweet potato soup vegan by substituting the butter with oil and using vegetable broth. Make sweet potato soup with coconut milk by reducing the amount of broth and adding coconut milk. Serve the soup chunky or pureed. Add onion and cook stirring a few times until they begin to get translucent, add the minced garlic and grated ginger, cook stirring until softened, about a couple of minutes. Add the curry and turmeric and cook stirring until the spices are fragrant, about 1 minute. Add the chicken (or vegetable) broth, the red lentils and the chopped sweet potato. If you are also using coconut milk, add it here. Bring to a boil and then lower heat to a simmer and simmer the soup for approximately 15 minutes, stirring now and then so the lentils don’t stick to the bottom of saucepan. When the sweet potato and lentils are tender, add 2 tablespoons of freshly squeezed lemon juice, salt and freshly ground pepper to taste. You can either keep the soup chunky or using a stick blender you can purée part of the soup or all of it if you prefer a creamier texture. You can also transfer the soup in batches to a blender and purée until smooth. Pour the soup back into the saucepan and adjust the seasonings and consistency of the soup with more broth or water. Garnish the soup with a dollop of yogourt and serve with lemon wedges (optional). You can use regular red lentils for this soup but they take twice as long to cook as split lentils. Make this soup vegan by using only oil to cook the aromatics and vegetable broth for the soup. If you are adding coconut milk to this soup, reduce the amount of broth by the same amount of coconut milk you are going to use (one regular sized can contains about 40 ml). You could always add more broth to thin out the soup if you find it too thick. It doesn’t have to be cold to enjoy a good soup and this one certainly sounds great. Yum, this looks so healthy and so pretty, I love the colour. I also love how quickly it comes together. Another winning recipe, Fida! Made this soup last night, it was delicious! That’s wonderful, glad to hear that you enjoyed it! I love creamy, curry soups! Love how you pureed the lentils, too!